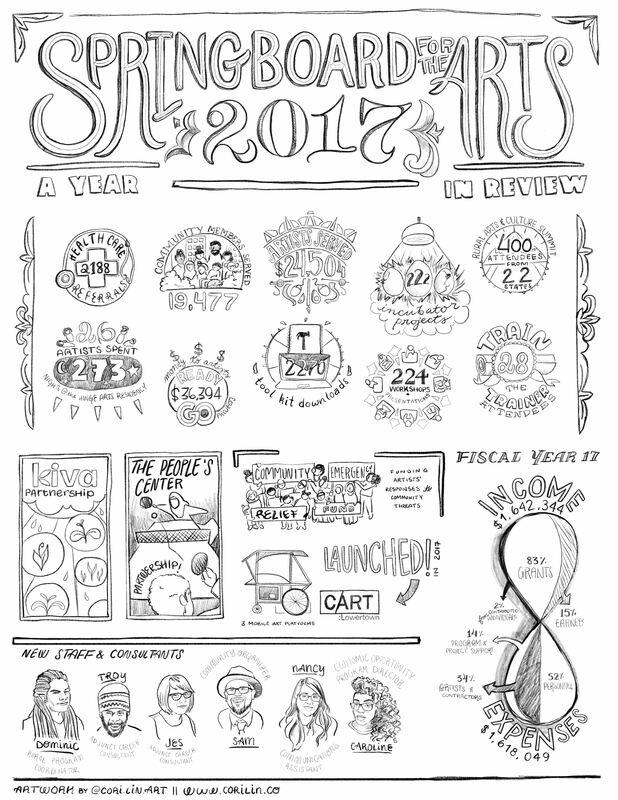 As an organization run by artists we always want to collaborate broadly and creatively, and our 2017 Year in Review that you are holding in your hands is no different. As you open up this poster to take a look at the busy year we’ve had, grab your colored pens and pencils to add your own creativity! Since I began at Springboard for the Arts 12 years ago, this organization has grown immensely. The staff has grown–we now employ 17 artists in 2 offices, plus 3 Adjunct Career Consultants. And the number of artists and community members we serve has grown beyond what I could have imagined at the beginning, to over 25,000 this year. All this growth is due to the breadth of our programming and partnerships, the ways that we have deeply evolved our programs to meet the needs of artists and communities. Our commitment to doing this work in Minnesota creates the foundation for us to share this work nationally, to shape and share the field with new ideas, programs and resources. 1) A collaboration with longtime partner People’s Center Health Services, our Artists Access to Healthcare program and our Ready Go artist roster (a mechanism for artists with mobile community engagement projects to be hired) created weekly artist projects on the lawn at the community clinic and demonstrated how art can create new conversations about healthcare and help support a clinic’s mission to become a community hub. These lively, joyful projects that connected neighbors across all kinds of differences were such a tangible demonstration of the power of artists. 2) We realized a long time goal to increase access to business capital for artists through a new national partnership with the microlending platform, Kiva. This new program has already helped artists access close to $70,000 of support to build and grow their businesses and invest in their communities. Our work is always motivated by the question, “What else is possible?” Our communities are filled with artists, creative workers, and community members who can shape the world we want to live in. Through supporting the fertile soil for creative work, and by developing mechanisms and pathways for us to collaborate and create together, collectively we can imagine and create new futures. We’ve recently started calling this idea “civic creative capacity”: we believe that civic engagement and creative capacity are inseparable and we cannot have the blossoming of one without the healthy roots of the other. You are so important to this work and I am grateful for your partnership, support and encouragement, thanks to all our institutional and individual funders. Thank you for all the work you do to create and sustain the civic creative capacity of our communities, and for all that is to come.